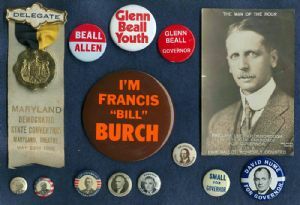 Among the items displayed here is a Delegate Badge from the 1928 Maryland Democratic State Convention held at the Maryland Theatre in Baltimore, Maryland. Although Albert C. Ritchie, a Democrat, was serving as Governor at the time, 1928 was an off-year for Maryland’s gubernatorial election. The Democratic candidate nominated for President in 1928 was Al Smith, who went on to lose to the Republican, Herbert Hoover. The Maryland Theatre was located in the 300 block of West Franklin Street and was razed sometime in the 1950s. John Edward Hurst (1832-1904), a Democrat, was a Baltimore dry-goods merchant who upon winning the Democratic nomination for Governor, was defeated in the November 5, 1895 General Election by the Republican candidate, Lloyd Lowndes, Jr. (1845-1905). Hurst received 106,169 votes, or 45.94% of the total votes cast, whereas Lowndes received 124,936 votes, or 54.06%, making him Maryland’s first Republican Governor since 1866. Hurst is represented here by two studs, one depicting the year of the General Election, “1895”. If by the votes of the electors of the State, I shall be chosen its Chief Magistrate, by the help of Him who ordereth all things, I shall consecrate the best efforts of my life to the accomplishment of those reforms which will bring about a high degree of efficiency in the performance of the affairs of State and will make for the highest type of public citizenship anywhere to be found. With this promise so solemnly made - in the midst of my own people, surrounded by lifetime friends, now watched and heard by those of my own blood in my own home, I earnestly say I shall strive to be true to the trust reposed in me. Made to the people of Maryland at the beginning of his response to the formal address of notification at Cambridge, September, 14th, 1911. Published by Authority of the Republican State Central Committee. J.B. Hanna Treas. Stevenson A. Williams (1851-1932), a Republican, was defeated by Democrat Edwin Warfield in the November 1903 election for the office of Governor of Maryland. Stevenson received 95,923 votes, or 45.97% of the votes cast, to Warfield’s 108,548 votes, or 52.01%. Charles H. Conley, a Democrat from Frederick County, received his medical degree in 1898 from the University of Maryland. He served as a Delegate from Maryland to the 1916 Democratic National Convention and in 1934 was among those who unsuccessfully sought the office of Governor of Maryland. This was won by Harry Whinna Nice, a Republican. Lansdale Ghiselin Sasscer (1893-1964), a Democrat, served in the Maryland State Senate from 1922-1938 and the U.S. House of Representatives from Maryland from 1939-1953. In 1952 he unsuccessfully sought the Democratic nomination for election to the U.S. Senate. The button displayed on this page was from an unsuccessful effort by Sasscer in 1938 to secure his party’s nomination for Governor. At that time he secured 23,587 votes, only 6.92% of those cast in the primary. Frank Small, Jr. (1896-1973), a Republican, served in the U.S. House of Representatives from 1953-1955. In 1962 Small ran against the Democrat, J. Millard Tawes, for Governor of Maryland. Small was unsuccessful, but did receive 341,271 votes, or 44.36% of those cast. David Hume, a Democrat from Charles County, was among the numerous candidates that opposed the incumbent Governor, J. Millard Tawes, in the May 15, 1962 Democratic Primary. Hume did not care for the conservation policies of Governor Tawes, but even more significantly Hume ran on a major issue at that time which was slots, and which he opposed. Hume finished third in the primary, behind Tawes and George P. Mahoney, with 118,295 votes or 26.72% of those cast. Francis "Bill" Burch (1918-1987) served as the Maryland Attorney General from 1966 through 1978. In 1978 he was one of several who sought the Democratic Party's nomination for Governor, which was eventually secured by Harry Hughes.